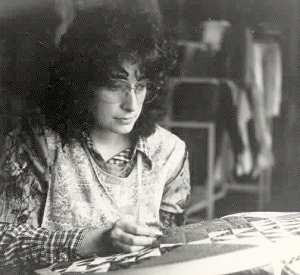 If you started quilting in the 1970s, you likely made a sampler quilt. The thought was that you wouldn't get bored making a quilt with different blocks, plus, you'd practice and perfect sewing skills doing various patterns. The problem with a sampler quilt, any sampler quilt, was that once the blocks were done, how did you choose the best fabric to put them together and what was the best block arrangement? Two huge considerations that stymied a lot of us...and accounts for many unfinished sampler quilts languishing in boxes and closets all over America. I found this wonderful picture on the Net and frankly hope it's all right to use it. It embodies quiltmaking in those days for my generation. We were, and are, the Baby Boomers and that often meant a stint at 'back to the land' living and a re-discovery of pioneer skills. 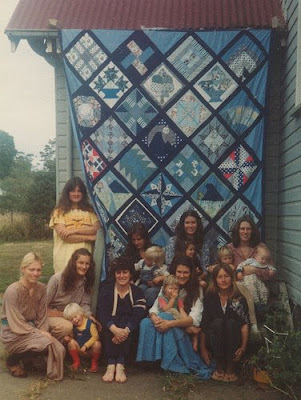 Here this group of young women and their offspring are proudly displaying a sampler quilt they made. I wouldn't be surprised if some of that blue fabric wasn't cut from jeans! If anyone sees this photo and can help further identify it or the people pictured, please contact me. Wouldn't it be lovely to know more about this group? The photo identification said, " Mt. Warning, NSW (New South Wales), Australia, 1978." Came on this old photo. That's me, also taken in 1978. I was very serious and very long-haired. It's a shock to think I've been quilting for 30 years. As a card-carrying hippie wild-child, I wasn't supposed to even live this long. Here's the last verse from Dylan's Forever Young and a link to his website so you can hear the master himself. Read through all the song's lyrics and have a great day.